Backing a heavy favourite in the Wimbledon tennis championship, the oldest tennis tournament in the world has resulted in many bettors and punters to place their bets on the players they support. Given this opportunity, many bookmakers all over the United Kingdom as well as online, have presented bettors the best deals and odds to attract them. 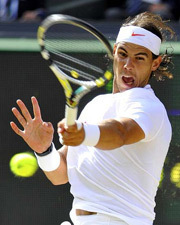 Numerous Wimbledon betting opportunities has been opened for punters especially over the two weeks of the Grand Slam. This is the time wherein the bets are pouring and bookmakers can’t help but seize this opportunity. In return, bookmakers go big by offering dozens of lucrative free bet packages, special betting markets, betting specials and all those opportunities to attract bettors who wish to bet on Wimbledon. Those bookmakers with online counterparts use their websites to catering to a worldwide audience. Their sites offer tips, news and odds on the latest happenings of the tennis championship. The tennis championship has been in action for over 130 years and since its birth, it still hasn’t lost even a single shine and prestige. It is one of the four Grand Slam tournaments, the other three being the Australian Open, the French Open and the US Open. Betting is also available on all the Grand Slam Tournaments but in the UK, the Wimbledon betting is the most favourite. The Wimbledon championship occurs yearly, over the two weeks of late June and early July. Wimbledon has traditions the other three Grand Slam tournaments probably don’t have such as the eating of strawberries and cream by the audience, royal patronage and the strict dress code for competitors. The championship has five main events, four junior events and four invitation events. The five main events are the highlights of the championship. These are the Gentlemen’s Singles, Ladies’ Singles, Gentlemen’s Doubles, Ladies’ Doubles and Mixed Doubles. The championship, as said by many, is considered to be the most sought after Grand Slam title. Bookmakers try their best to make the betting more special than the usual due to its prestige. “Special tennis” odds are given wherein the odds are more intricate and is fact based backed with research from events of the past that might have a connection to the current events. The bets at Wimbledon have two types of betting odds – futures betting and match betting. Futures betting is the most popular among both novice and expert bettors as it is the usual betting for the champion of the tournament while match betting provides endless possibilities. Whichever type of betting is picked, a punter will surely have a great time both watching the championship and betting on his favourite. The Wimbledon championship only happens once a year and when its season is nearing, everyone is gearing up for it. The championship is aired on television making it available for those who want to stay home and watch it but those true blue fans would watch the championship in person. In the betting world, keen Wimbledon betting fans would not miss the chance for anything especially since the bookmakers make their offers extra special, fans would take the risk for their favourite players. In turn, players of the professional tournament wouldn’t let them down by giving them a fight worth watching.